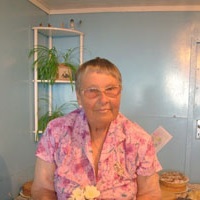 Obituary for Tristan da Cunha islander Lucy Swain, who passed away 17th June 2018, aged 83. We regret to announce the death of Lucy Germon Swain, who passed away aged 83 on Sunday 17th June 2018 at her home. Lucy was the youngest child born to George and Maggie Swain (née Swain) on 26th November 1934. She had three siblings, two brothers Walter and Jacob and sister Eileen. She married Cecil Swain in July 1957 and had two children. Lucy was a kind, generous, caring person who always put others before herself. She worked for many years at the fishing factory and as a cleaner at the hospital. She believed strongly in her faith and regularly attended church until her illness prevented her. She was a member of the Tristan Mothers Union which held meetings in church and later at members homes. Lucy is survived by her son Thomas, daughter Carol, daughter-in-law Pam, grandsons Damian and George, granddaughter Sonia and great grandchildren Natasha and Mia. The family would like to thank all those who sent messages of condolence. Lucy will be sadly missed, always in our hearts and never forgotten.